Through streaming, every gamer has a chance to showcase their skills and speak to the world. It's our mission to create high quality streaming equipment like webcams, microphones, and capture cards that aren't just easy to set up and use, but also records smooth footage and superior audio clarity. 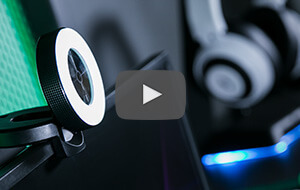 Razer Broadcast Studio Hardware has even been tested and verified by the best streamers in the world as some of the most dependable in the market. First impressions count when streaming, and with the Razer Kiyo, we've created a streaming camera that records 720p resolution at 60 fps for true gaming fidelity. It also comes with a powerful multi-step ring light that puts a perfect spotlight onto your face, providing greater image clarity under any lighting condition. Any streamer who wants their voice to be truly heard needs a proper streaming mic. 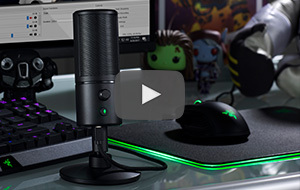 Look no further than the Razer Seirēn Series—built with professional-grade microphone technology that records rich and true-to-life sound with minimal noise and electrical interference. Whether it's a condenser or a dynamic mic, the tone of your commentary stays crystal clear throughout your broadcast. Want to learn how to set up your broadcasting camera? Our broadcasting peripherals sync with the most popular streaming and video conferencing platforms so all you need to do is plug them in and you're ready to go live. Subtle but superb. The Razer Ifrit is an in-ear headset and broadcaster-grade mic rolled into one, with a slim frame and over-the-ear design that keeps it lightweight and discreet. Whether it’s on your desktop, mobile phone or console, now you can stream like pro from just about anywhere.